"Stevie Hopkins is a serial entrepreneur who after many ventures finally found his life's work in 3E Love. Calling on his experiences in the financial industry, music business, and web startups, Stevie was able to turn his sister Annie's dreams into a reality. He has worked tirelessly to spread the symbol across the globe. The experiences he has had traveling thousands of miles, meeting people all over the country and speaking to groups telling his story, has changed his life forever. ​3E Love, LLC. 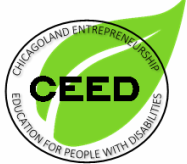 is a social entrepreneurial experiment to change the perception of disability. 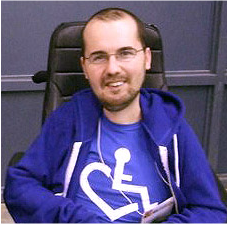 The company was started by siblings Annie & Stevie Hopkins in 2007 with the intent of promoting their unique symbol and social model of disability. The company's trademarked International Symbol of Acceptance (wheelchair heart logo) is the drive behind it's social mission to provide the tools for others to embrace diversity, educate society, and empower each other to love life. What was once just a small Chicago disability pride clothing brand is now an international movement of acceptance. People with disabilities are everywhere, and thousands of t-shirts and other items later, so is the 3E Love message."